Enjoy the party before the big crowd, or stay all night! Moondance is our 12th Annual Membership Celebration. Throughout the night, Members will enjoy live music by The Very Hypnotic Soul Band, feast on hors d’oeuvres and spirits, have their portrait made by Leslie McKellar on the signature Moon backdrop, and enjoy performances by the College of Charleston Dance Department, and The Charleston Guild of Gentlemen Puppeteers. 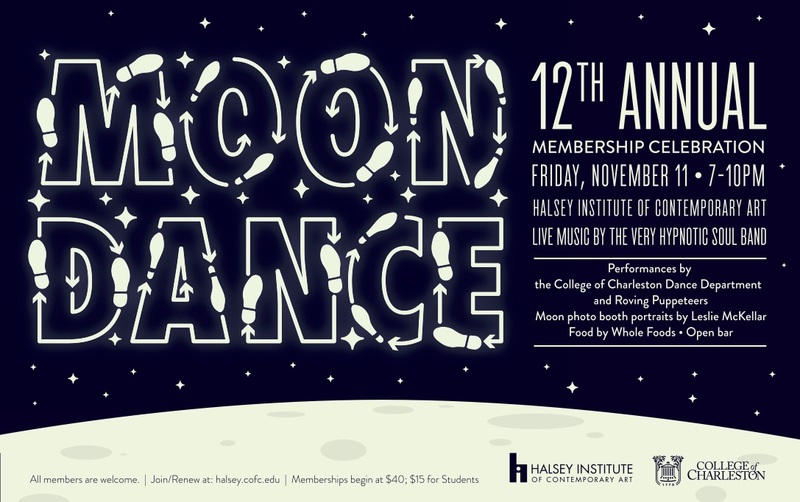 Dance the night away with other Halsey Institute members. To attend the event, join or renew your membership online or call us at 843-953-5652. Membership levels begin at $40; $15 for students. Our members support the Halsey Institute’s groundbreaking exhibition and educational programming, which has become a vital part of the Charleston community.